With the autumn equinox nearly a month behind us, the holiday season on the horizon, and a palpable crispness in the air, it's time to turn a new (brightly colored) leaf. So if your vanity still reflects warmer times, consider taking stock in fall's hottest (or should we say coolest?) beauty trends. To find out which styles and products are running the gamut this season, we turned to our friends at Pinterest for the most-circulated beauty looks. While jewel-toned makeup expectedly resounds, some unexpected movers and shakers are taking center stage, especially in the hair space (one '70s-era style is the clear look of the season). Take a look below for all the inspo you need this fall. Burnished lips are the grungy-cool makeup trend blowing up on Pinterest as of late. In fact, searches are up for the look 110%. Not ready to go full-blown heavy metal on your pout? We love the idea of placing a bit of gilded tint on cupid's bow, like in the photo above. 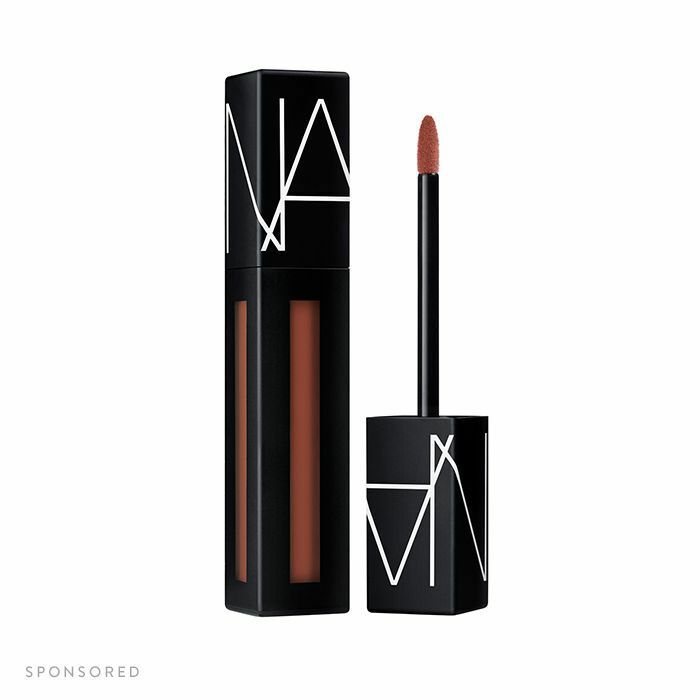 A swipe of Nars Powermatte Lip Pigment ($26) on the lips in a deep burgundy is the perfect complement. Bright blue lashes are the subtle yet poignant beauty look you didn't know you needed to try. In just the right lighting, a set of cobalt flutters are sure to wow a crowd. Ashlee Glazer, Laura Geller’s global artistic director suggests foregoing eyeliner altogether to help them pop even more. Once again, metals take the stage this fall, this time, as a pop of shimmer on the lids. Try swiping a bit of Beyu's creamy eye pencil all over the lids and blending out with your fingers. The shade? Fall for Copper—how fitting. There are so many ways you can play with half-up hair, whether it's braided, topsy-tailed, or, like the image above, a messy half bun (or "hun"). It's the perfect alternative to wearing your hair all the way up, especially as the temperatures drop, while still getting it out of your face. Curtain bangs are by far the most popular fall hair trend, garnering a whopping 600% increased search rate year over year. The style is very '70s—think Brigitte Bardot—and requires only parting the bangs down the middle so they essentially resemble curtains around your forehead. To keep them put, try working a small dot of Sachajaun Hair Paste ($31) into both sides. It's true: Balayage is still a hit color trend (not to be confused with ombré). The copper variation is a fitting rich tone for fall, as evidenced by the lustrous makeup trend above. We especially love it with a chestnut base, as extreme ends of the spectrum of both dark and light hair colors don't pair as seamlessly. For those fearlessly ready to take the color leap, try giving purple balayage a test drive. Scanning the trend on Pinterest, it's predominately featured on chocolate and raven hair, but a pastel transition on blonde hair is equally as stunning. Mansur Gavriel sent its models down the runway in an '80s and '90s hair accessory staple in the F/W 18 NYFW show: scrunchies. Just like high-waisted mom jeans and oversize checked blazers are making a comeback, beauty looks from this decade have also been resurrected, so consider pulling your fluffiest, most colorful hair ties out of your childhood memorabilia for a serious dose of nostalgia. Choosing the right nail art can be tricky, especially when finding the right nail polish shade at the salon seems like a daunting task in and of itself. But consider this trend the next time you pay a visit to your manicurist. Marble nails subtly offer a bit of shade variation and depth that deserves placement in a museum. Which trend is your favorite? Sound off below!